Welcome to NW Cannabis Connection We Serve the Puyallup, Tacoma, Sumner, Milton, Fife, Lake Tapps, Bonney Lake, Buckley, South Prairie, Orting, Graham, Parkland, Lakewood, Frederickson, Spanaway, South Hill areas. We are located right off Highway 512 in Puyallup On Canyon Rd E and 116th Ave next to Austin Pro Maxx and across from Walgreens and Safeway. With Parking in the Front and Back. We Open Early & Close Late 8am - 1pm Monday Thru Saturday 9am - 9pm Sunday Here at NW Cannabis Connection we have exceptional customer service and knowledgeable Bud tenders. We came from the Medical Cannabis industry and have been helping patients since 2010. Their are 3 bud tending stations to help you with your purchasing needs. We Offer a Large Selection Of Marijuana Flower, Concentrates, Edibles, Topicals, Tinctures, Pre-Rolls, Cartridges, Glass Pipes and Accessories. 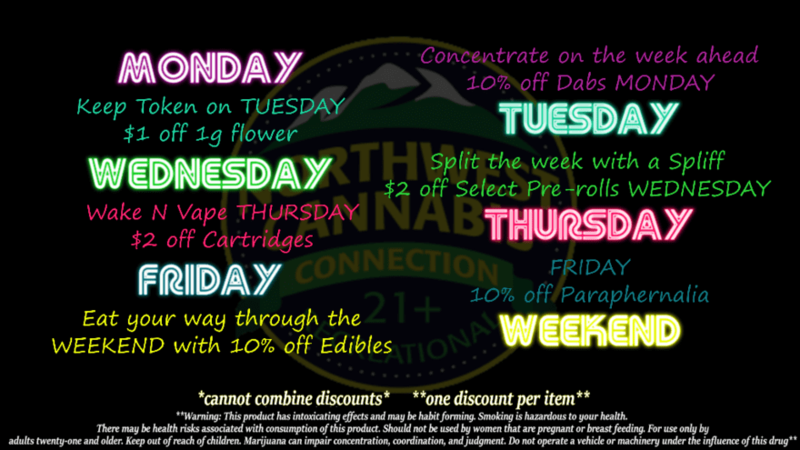 Flower starts at $7 a gram / $18 an 1/8th Concentrates start at $15 a 1/2 gram / $25 a gram We try to have the Best deals in Town - Quality product at affordable Prices - Check out our daily specials at [Www.NWCannabisConnections.com](www.nwcannabisconnections.com) We Carry Many different Cannabis producers Agro Mechanix, Alis Group, Artizen, Avitas, Seattle Spot Bakery, Doc Croc, Dream City, Ethos Extracts, Evergreen Herbal, The Greenery, The Green Vault, Fireline, Forbidden Farms, Forte Farms, Harmony Farms, Hempkings, Ladyhelm Farms, Landseye Logistics, North Coast Concentrates, Northwest Cannabis Solutions, OG Farms, Ol' Goat Cannabis, Oleum Extracts, Serenity Gardens, Sitka, Sticky Budz, Sweet Nirvana Bakery, Swift Edibles, The Green Vault, Top Shelf, Torch Northwest, White Star, Viva Cannabis. !!! Come in and Check out our daily Specials !! !